About 8,000 British troops based in Helmand province in Afghanistan are to come under the operational command of the US, the Ministry of Defence says. The move is part of a restructuring of Nato forces, with command and control in southern Afghanistan split into two. The UK's Maj Gen Nick Carter will now oversee Kandahar, while Maj Gen Richard Mills from the US will take on Helmand. Meanwhile, a British marine from 40 Commando Royal Marines has been killed in an explosion in Sangin. 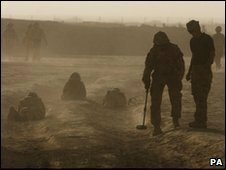 The command of the 1,100-strong British battle group based in Sangin - an area which has seen a number of UK deaths recently - and in Kajaki will also come under US-led force from 1 June. Maj Gen Gordon Messenger - UK troops will see "very little change"
Asked about the changes at a news conference in Berlin, Prime Minister David Cameron said the move "does make good sense in terms of maximising the impact of what both we and the Americans are doing in the southern part of the country, which is absolutely vital". "British and American troops have been working together in many theatres over many decades and don't have a problem working together," he said. The changes were announced by Maj Gen Gordon Messenger, who told a news conference in central London that the changes made "complete sense" and were "welcome". "The span and complexity of the command challenge in southern Afghanistan has increased enormously in recent months and these changes provide the best command support to the troops on the ground," he added. This change in command structure for southern Afghanistan makes military sense. Nato commanders agree - with a recent influx of US forces there are now too many troops in too big an area for just one command. There have also been two separate military operations going on in Helmand and Kandahar. Nor is there any real political controversy over the fact a US two-star general will take charge of British troops in Helmand. In the past they have come under Dutch and Canadian command. General Stanley McChrystal has long stated that he is "nation-blind" when it comes to Nato forces. That is not to say there are national sensitivities. The British are keen to point out that in future the command of Helmand will rotate between American and British generals. There may also be controversial changes ahead. Nato commanders have been debating whether there are enough troops in Sangin - where British forces have suffered heavy casualties. Sangin and Kajaki have now been transferred to the control of a US-led force. It raises the question as to whether US troops will reinforce or even eventually replace British troops there. Asked if the change meant Britain was effectively giving up its responsibilities and handing them over to the US, Maj Gen Messenger said that was "simply not the case". He said: "This is us doing exactly the same job as we have been doing up to now, under slightly different arrangements. "The whole business of a greater American presence is a reflection of the scale of the challenges that the British have faced in Helmand." Maj Gen Messenger said Britain had been "closely involved" in the preparations for the change, stressing: "It in no way indicates that things have been going wrong previously." The UK force level in Afghanistan is currently 9,500, but with special forces totals some 10,000. 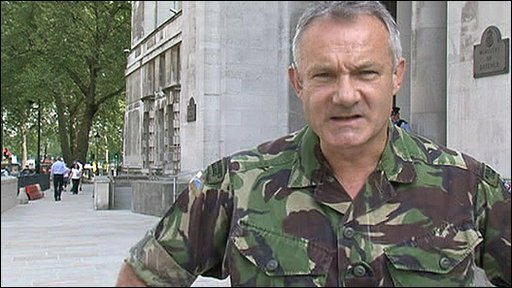 BBC defence correspondent Jonathan Beale previously reported how the recent influx of American forces meant there were now too many troops in too large a geographical area for just one command. Meanwhile, footballer David Beckham is on his way to Helmand in a surprise visit to British troops. The 35-year-old former England captain said he had "nothing but admiration" for UK troops who were doing an "amazing job... in very difficult conditions" and made him "very proud to be British".